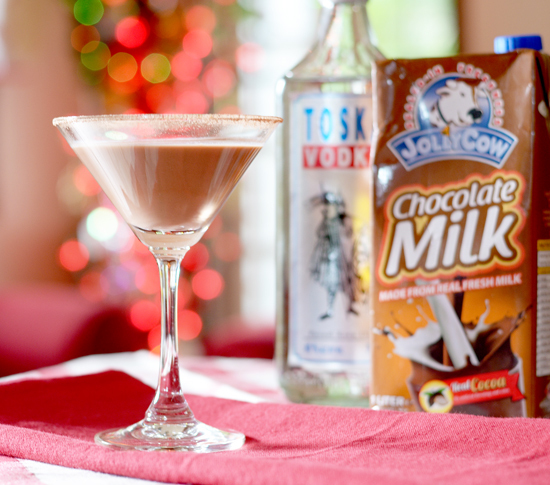 4 TIMES JOLLY COW CHOCOLATE MILK - THE BEST CHRISTMAS DRINK EVER! We’re down to few more days ‘till Christmas. I know you’re all excited for this year's celebration. I am too as so much blessings to celebrate this year. But along with all these excitements are stressors we just can’t pass up – traffic, long cashier queue, office year-end deadlines, so much to do yet so little time. But here are few suggestions I have for you how to liven up your life despite the holiday pressure. 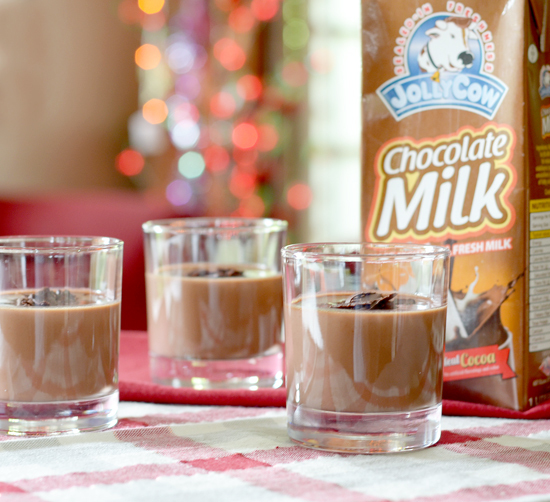 If you have recently bought a Jolly Cow Chocolate Milk for your kids, or if you haven’t yet please pick one on your next trip to the grocery, and it’s just sitting on your fridge, here are four ways how to enjoy them aside from the usual twist-pour-drink routine. Panna Cotta is a classic Italian dessert. They are super easy to make and for many of us who have no luxury of time this Christmas, they can be made as quick as lightning and they can be prepared in advance and just let it set in your fridge overnight. ½ cup grated dark chocolate, set aside few crumbs for the trimming. Continue stirring until the mixture appears no lumps and everything else blended. Let’s make a little twist out of our wholesome kiddos choco drink. While I know adults would enjoy this drink just the way it is, it can also get boring – so fret not! Here’s what we can do with this yummy choco drink! If sweat comes out of the shaker wall, your choclatini is perfectly ready. Pour it into your choco-rimmed martini glass. Want a stronger kick? Add more vodka! Alright! Enough with the adults. Christmas is really about kids so lets make one for them. Weather during this season is supposed to be nippy and cool but for some climate reasons, Christmas on this part of the world now is a lot hotter than ever before. 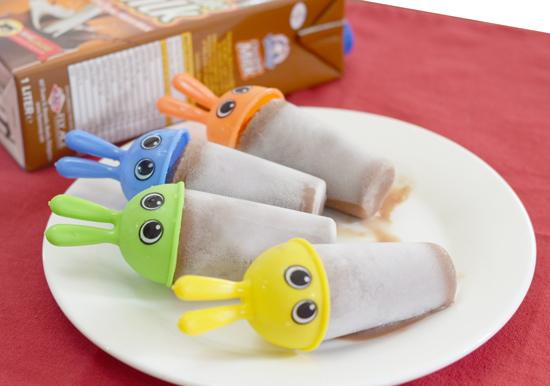 What better way to soothe the heat than a yummy chocolate popsicle? Making this is ultra easy. Pour into fancy molds and freeze! And Viola! Your healthy Jolly Cow Chocolate Banana Popsicle after 2 hrs. Oh, how I love smoothies! The moment Ms. Lormy Papa, Jolly Cow Chocolate Milk Drink Product Officer, told me she’s sending over Jolly Choco Milk for me to try, making smoothie came immediately to mind. 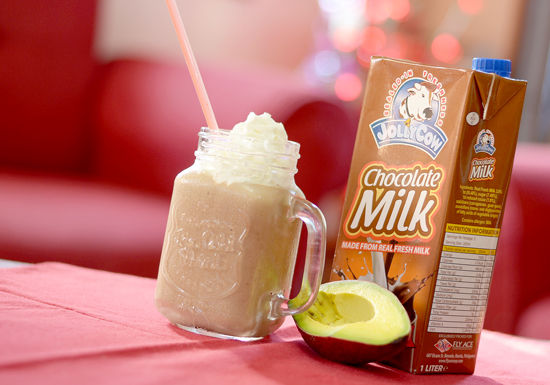 And true enough, here I am sharing my Jolly Cow Chocolate Avocado Smoothie to you. Again, this is easy-peasy to make. Pour into your mason jar and spritz in a mound of whipping cream frosting on top. Enjoy the holidays! I hope you enjoy me sharing something to do this Christmas! Jolly Cow Chocolate Milk is made from 100% pure cow’s milk. No vegetable fats were used. Contains 2.6% Butterfat and the chocolate component is made from real cocoa, making it creamier and tastier. It also has no artificial flavourings and colour. FlyAce Corporation, 607 Elcano St., Binondo, Manila, Phils. Dislclaimer: I wasn't paid by FlyAce Corp. but was given products to try and review. All opinions are 100% mine.